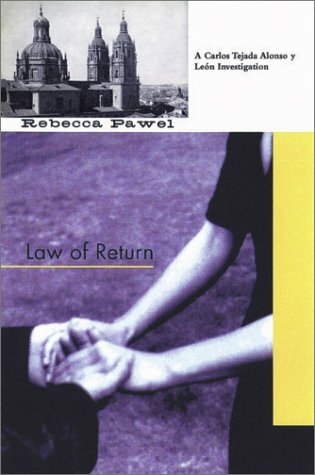 The second book in the series, Law of Return, is now in bookstores! In the summer of 1940, life is good to Carlos Tejada, aristocratic falangist, and enthusiastic supporter of General Franco's fledgling dictatorship. Newly promoted to the rank of lieutenant in the Guardia Civil, Tejada receives a transfer from poverty-stricken Madrid to the provincial capital of Salamanca. A conservative town, famed for its university, Salamanca's early dedication to the winning side of Spain's Civil War has spared it the devastation visited on Madrid, and it remains relatively peaceful and prosperous. But Tejada quickly learns that his transfer to Salamanca is a mixed blessing. Not only is he forced to deal with an unsympathetic superior officer, he is soon caught up in the investigation of the disappearance of a politically suspicious but embarrassingly well-connected former professor. To complicate matters, one of the men who may or may not be involved in the professor's disappearance is the father of Elena Fernandez, a woman who Tejada remembers well from Madrid, and who he finds all too attractive, in spite of her left-wing politics. His search for the truth takes him across Spain, and finally forces him to choose between his political convictions and his desire to protect the innocent. For those of you who have read the book, see links relating to Law of Return. Check out Death of a Nationalist, the first book in the series. See a preview of The Watcher in the Pine, the third book in the series.